Finistere, meaning 'Land's End' is Brittany's most westerly department. The Breton people have a very distinct identity, and in Finistere live the proudest Bretons of them all. Despite officially joining the rest of the country some 600 years ago, the locals still retain their own customs, dances and songs. The department is inhabited by a large proportion of sailors and fishermen, and much of the local folklore involves the sea. The Medieval city of Quimper is the best place to go to indulge in authentic Breton culture. On lively evenings you can listen to bagpipers and singers who use music to tell you tales of adventure on the high seas. Head Southeast and you will discover the renowned Pays de Bigouden with its traditional fishing communities set amongst a dramatic coastline. The department has two islands, the Ile de Batz and the Ile d'Ouessant. Batz is just 2 miles long and 1 mile wide. It has sheltered sandy coves and, by a strange quirk of geography, a great climate. The Ile d'Ouessant, known as Ushant to the English, is considerably larger. It is a calm and tranquil island and, by the last count, had more sheep than humans. The little woodland that exists in the department is to be found in the Parc Naturel Regional d'Armorique to the East of the Crozon Peninsula. 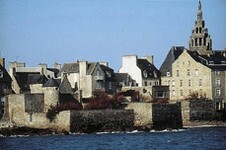 No matter what time of year it is, Roscoff can appear to be a grey town. Don't let the colour of the buildings put you off, though, as there is a lot to see and experience in this bustling port. Just to the South of the main town you will find Roch-Hievec, a number of peaceful gardens packed with a variety of flora that looks quite alien to Northern France. Cacti and palms are encouraged to grow, here, thanks to the unusual climate brought by the Gulf Stream. Carantec is a town specifically built to lure family holidays to the department. It has fantastic facilities for camping, sailing, fishing, bird watching and a whole host of other relaxing activities. From here you can explore the Ile de Callot, which is only actually an island at high tide. When the sea is out you can simply walk there across a sandy walkway. In the East of the department you'll find a picturesque port town called Locquirec. Inside the town you can take a look around its fascinating 15th Century church. After this, head over the dunes and decide which of the nine stunning beaches you want to relax on. There are plenty of opportunities to sample the local produce sold at roadside stalls. The most striking coast in Brittany is to be found in the northwest of the Finistere department. There are a number of tucked away communities living among the crashing waves and high cliffs, which are well worth seeking out. 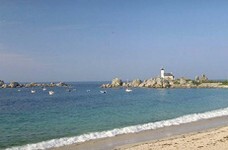 Brignogan-Plage is one such town, which is endowed with a fine sandy beach and a safe swimming environment. There are also opportunities for sailing and horse riding. Keep looking and you'll find a number of other notable hamlets such as Aberwrach, Porsporder and Portsall. Head to Tremazan if you want to explore some intriguing history. The town's castle is enveloped with legend. It is thought that Tristan and Yseult (of the King Arthur fame) fled here from Cornwall. Brest is not the most attractive town Brittany has to offer, as it was rebuilt at great haste following World War II. Nevertheless the town has a lot to show visitors. Every summer the town puts on an extravagant festival promoting Breton culture. The town also has its own castle, which is now a great museum exploring the history and development of the Old Town. Brest is on the front line in preserving our underwater habitats and ecosystems. The gigantic Oceanopolis building serves as a research centre for marine biology. The town is also home to the French Atlantic Navy fleet but you are only allowed near these enormous boats if you are a French national! Le Faou is a tiny medieval port that acts as the gateway to the Crozon Peninsula, one of the most attractive parts of Brittany. It is here that you will find the magnificent nature reserve, Parc Naturel Regional d'Armorique. Head to the top of the 330 meter high Menez-Hom and you will find a great vantage point to admire the landscape below and out over the Bay of Douarnenez. There is a folklore festival held here on August 15th every year. One ferry company has played a peculiar part in the region's history. In 1963 services between Southampton and St Malo came to an end leaving the farmers in the region without a means of transporting their cattle. The farmers took to the streets in protest and one activist, named Alexis Gourvennec, was jailed for his role in the clashes. He left jail unrepentant and set up his own service to link the region with the UK once again. He decided to call the service 'Brittany Ferries'. They sail regularly from the UK to Roscoff or St Malo. Caen and Cherbourg in Normandy are other nearby ferry ports with regular crossings. There are also super fast catamaran services heading to Brittany. Flying is still an option. Within the department there is Brest airport with direct flights to/from the UK, though for more choice, Dinard airport is also within reach. The cheapest properties are to be found inland, although remember that wherever you decide to go you are never far away from the coast. Finistere is a great place to look for bargains and renovation properties. At the time of writing we have a two bedroom town house for renovation at a cost of €82,049. Do you know Finistère better than we do? Do you have photos of Finistère? At the westerly tip of Brittany and France.